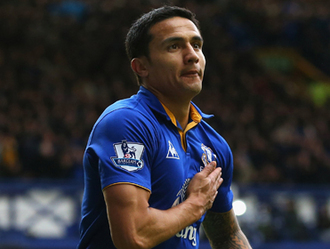 Tim Cahill is a professional footballer who was born in Sydney in 1979. He has represented Australia since 2004 and he currently plays his football in the United States for the New York Red Bulls. The forward has an English father and Samoan mother. Although he chose to play for Australia, his brother Chris Cahill is captain of Samoa. Cahill turned professional in 1997 when he moved to England to sign for Millwall. He made his debut for the London club on May 22, 1998. The Australian's performances in the 2003/2004 season, when the Lions made their way through to the final of the FA Cup, caught the eye of Everton, who paid £1.5million for his services in 2004. Cahill went on to make 226 appearances for the Toffees. He scored 56 goals in his nine-year spell at Goodison Park. In his first full season for Everton, he ended the campaign as their top goalscorer. He was also voted the fans' Player of the Season. Two years into his contract, Cahill was given an extended deal which saw his salary increase. That was in recognition of the impact he made in his opening couple of years. In October 2006, the Australian received 50 nominations for the Ballon D'Or. He was the first Everton player in 18 years to pick up a nomination for the award. His goal in the 2008 Merseyside Derby at Anfield helped him match Dixie Dean's record for scoring in three derbies at the home of local rivals Liverpool. Cahill left Everton in July 2012 where he moved to the United States to take part in the MLS for the New York Red Bulls. He made his debut against Houston Dynamo a month later. In an international career which spans back to 2004, Cahill has played in two World Cups for Australia. His opening game for his country was against South Africa on March 30, 2004. He also took part in the Summer Olympics that year. His side reached the quarter-finals before being eliminated. At the 2006 World Cup he became the first Australian to score a goal at any World Cup. That came against Japan in a group game. Australia did make it through to the last 16 where they were beaten by eventual winners Italy. Four years later, Cahill was back with Australia for the competition held in South Africa. He was shown a red card in the opening group game against Germany which meant he had to sit out their second tie against Ghana. He did return, though, for the clash with Serbia in their final game of the tournament.